Performing next in Milton, MA in May 2017! Click here for show info! 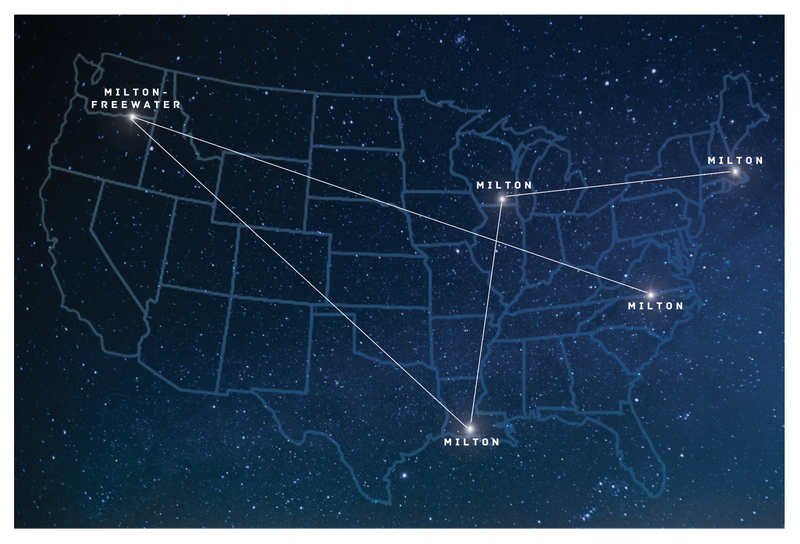 In 2013, we began visiting 5 towns named Milton across the U.S., in Massachusetts, North Carolina, Louisiana, Oregon and Wisconsin. In each town, we met with a diverse cross-section of people, talking to them and asking them questions about their lives and the world. How did you get to Milton? If you could change one thing about the world, what would it be? Do you have advice for future generations? Why do you think we’re here on this earth? We worked with Jim Findlay to shoot 24 hours of video footage of the sky over each Milton. Why the sky? Well, in our minds, these five Miltons stretch over, up and across the United States, forming an earth-bound constellation. Four years into the project, the conversations we are having are still helping us discover the story of this constellation. Our experiences in each Milton are the inspiration for a performance that we bring back to each Milton. Picture a gathering of locals, with three performers of different ages and races speaking and singing, surrounded by video of the skies over Milton. Sometimes it might feel like being in a planetarium. Sometimes it might feel like being at the opera. Sometimes it might feel like being at a family birthday barbecue, under a big sky. 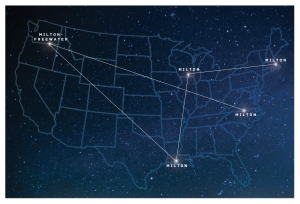 We originally created our constellation of Miltons to fight any generalities we might have about being American, or about small town life. Over the two years that we were making our last project, How to Build a Forest, the economy crashed, revolution spread virally across the Middle East in the name of democracy, and the divide between Democrats and Republicans in the U.S. practically shut down the government. When we started thinking about MILTON, it was election season, and the TV radio and the internet were overflowing with platitudes and generalities about what it means to be an “American”. We feel like we have, at best, a tenuous grasp on what it means to be American. By traveling to towns we’d never need to go to and talking to people we’d never have a reason to meet, we seek order and meaning: Like the Big Dipper for a sailor out at sea, can this newly-born constellation help locate us? Guide us? What wisdom will we find there? MILTON premiered in the Milton, NC Women’s Club in August, 2014. Check out this great radio interview from WUNC in Raleigh Durham that Katie did with Vanessa “Twinkle” Graves and Jean Scott, two local NC Miltonians, about the show’s premiere. Our second show was in Milton-Freewater, OR, where MILTON became a bi-lingual play (Spanish/English) to match the town’s demographics. As we head into 2017, the project continues to assert its values of conversation, connection, and creative exchange in Milton, MA, where we have worked with locals to create Milton Reflecting, a year-long series of interconnected creative programs designed to bring Miltonians of all ages together to reflect on, claim, and celebrate the extraordinary diversity of their town. Our MILTON play will be one event in this series, happening in May 2017. We look forward to bringing some version of the project to the Miltons in WI and LA as well. Visit our Sky Over Milton website, which tracks the national project. Visit Milton Reflecting to learn about local events in Milton, MA. Milton is supported by two NEA Our Town grants, NYSCA,the MAP Fund, Irving and Anne Linn Charitable Trust, the Danville Regional Foundation, the Collins Foundation, the Oregon Arts Commission, ¡Celebrate Milton!, The Copeland Family Foundation, the Milton Junior Women’s Club, and hundreds of generous individual donors.